ASCII Animator is a unique, funny and free software to convert GIF image to animated ASCII art. First, ASCII Animator extracts GIF image into frames, then converts each frames to ASCII art, and encodes the ASCII art into a new animated ASCII art GIF image. ASCII Animator needs Microsoft .NET Framework 2.0 or later. ...... ASCII art which can be played on web browsers such as Internet Explorer, Google Chrome or Mozilla FireFox. To export actual animated ASCII art, click menu Settings -> Settings..., select option "Animated ASCII Art (.html)". Qweas is providing links to ASCII Animator 1.7 as a courtesy, and makes no representations regarding ASCII Animator or any other applications or any information related thereto. Any questions, complaints or claims regarding this application ASCII Animator 1.7 must be directed to the appropriate software vendor. 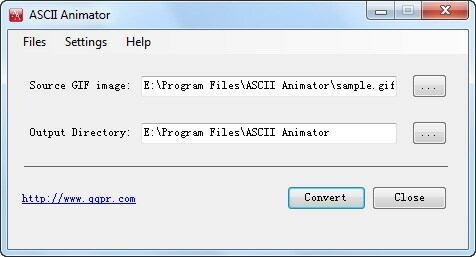 You may click the publisher link of ASCII Animator on the top of this page to get more details about the vendor.